Farrar, Straus and Giroux, 9780374533557, 512pp. “Daniel Kahneman is one of the most original and interesting thinkers of our time. There may be no other person on the planet who better understands how and why we make the choices we make. In this absolutely amazing book, he shares a lifetime's worth of wisdom presented in a manner that is simple and engaging, but nonetheless stunningly profound. This book is a must read for anyone with a curious mind.” —Steven D. Levitt, William B. Ogden Distinguished Service Professor of Economics at the University of Chicago; co-author of Freakonomics and SuperFreakonomics. 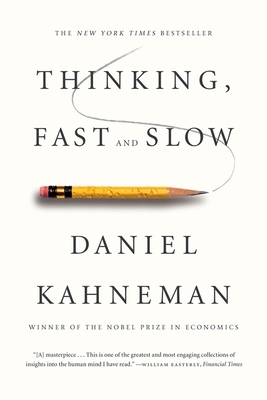 “Thinking, Fast and Slow is a masterpiece--a brilliant and engaging intellectual saga by one of the greatest psychologists and deepest thinkers of our time. Kahneman should be parking a Pulitzer next to his Nobel Prize.” —Daniel Gilbert, Harvard University Professor of Psychology, author of Stumbling on Happiness, host of the award-winning PBS television series "This Emotional Life"